I have a fun and simple recipe for your Monday. Maybe you're on holidays, or maybe you're at work, but either way, you're going to want to make this for dinner... and then again for breakfast tomorrow! This is a soy-free and gluten-free alternative to your usual tofu omelette or scramble. Not that there's anything wrong with a tofu scramble. I love them! But it's fun to mix things up a bit once in a while. This recipe uses chickpea flour (or garbanzo bean flour) which you can find at a Bulk Barn, or in stores (Bob's Red Mill makes one) and at Indian markets as Besan flour. I've tried making an omelette using chickpea flour once last year but I completely destroyed it. I don't even remember if it tasted good but I do know that I wasn't in a hurry to try again anytime soon. Then, chickpea omelettes started popping up on my instagram feed and the pictures would make me drool! I finally decided to try again. I took a few pointers from a couple of different users and I was so thrilled with how it turned out! Obviously, I had to share it with you guys! After you've gathered all of your ingredients, preheat your pan on medium heat. Combine all of the dry ingredients in a small bowl. Add the water and whisk it all together. The consistency should be on the thinner side, like a beaten egg except a bit more watery. If it's too thin it will not cook properly (trust me). Brush a bit of Earth Balance butter on the pan before pouring the mixture in. Swirl the mixture around until it's evenly distributed in the pan. Then leave it to cook for about 4 minutes. Don't fuss with it and NO flipping. While it's cooking, prepare your filling. Don't be shy, choose whatever you want. I chose asparagus this time. I marinated it for a couple of minutes using my vinaigrette and then I quickly grilled it on the stove while the omelette was cooking. You'll know the omelette is done when it starts to pull away from the sides of the pan and the edges begin to lift up a bit. Ease it onto a plate using a spatula for support. Then, add your filling to the omelette before folding it in half. Easy, right? And the best part is that you can play around with the spices to suit whatever filling you want to add. I've added a bit of cumin and chili powder to the base and then warmed some salsa to fill the inside with along with some greens. So good! 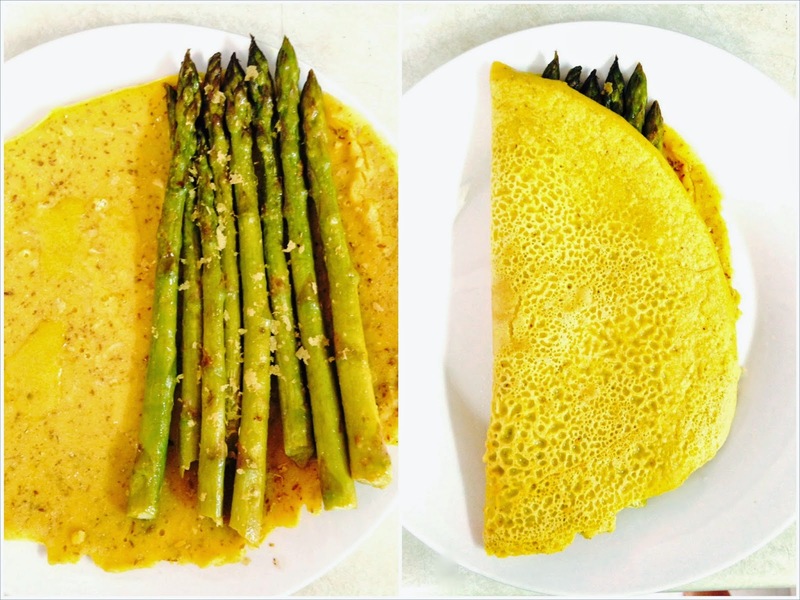 FYI: There's 13 grams of protein in this omelette from the chickpea flour, flax seed and nutritional yeast! Enjoy and have a Happy Monday!